Some people know me as Dan Keplinger, others as King Gimp, but they both stand for loyalty, honesty and a fighting spirit. I was born with Cerebral Palsy on January 19, 1973. My formal education started when I entered early intervention at eighteen months of age and continued in special education until I was mainstreamed at the age of sixteen. It was then that I discovered my artistic talent. The finale to my formal education was obtaining my MFA at the age of thirty-five. 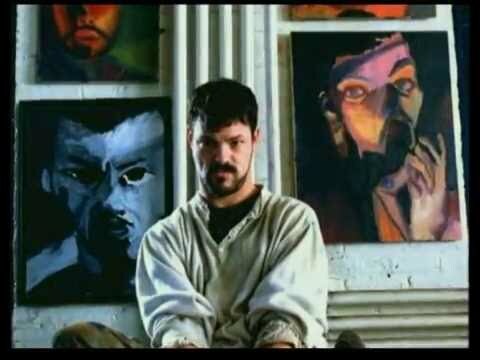 My life was the subject of the 2000 Oscar Award winning documentary 'King Gimp'. I was then featured in a Cingular commercial during the 2001 Super Bowl. I currently travel nationally and internationally with my wife as an artist and speaker to inspire everyone to find their passion in life. Recently those travels included a live painting demonstration at a DC Metro Theater as well as a panel at the United Nations. In addition, I've completed an Artist Residency to produce prints. As a guest lecturer or speaker, I generally show one of the films about my life, talk about my experiences, and answer questions from the audience. Given a longer day, I also bring the magic of creating a drawing while others watch. Once you book a drawing event, the piece is yours to display or use as a fundraiser. I hope you will be interested in sharing the rich diversity of my life with your staff, clients, and their families. Following are links to more information on King Gimp, as well as to some quotes about Dan. Book Dan Now and Become Inspired by a King.